Professional schematics and photos show TFT proportion standing, moving, and in skeletal detail, for the American Toy Fox Terrier Club Judges Education (JEC). The Toy Fox Terrier is a small terrier that ranges in size from 8 ½” to 11 ½”. They are the epitome of a big dog in a small package. Their personality and temperament should reflect terrier courage and animation. They should have grace, elegance and agility all displayed in equal measures that balance and compliment the total dog. Type and temperament are embodied in a well-balanced, square package of terrier attitude that moves forward with grace, elegance, gusto and style. The body is balanced with the length approximately equal to the height. The length is measured from the point of shoulder to the point of buttocks with the height being measured from the withers to the ground. Substance should be substantial but not overdone for the size of the dog. Although the AKC breed standard makes no mention of the correct weight for a Toy Fox Terrier, the original UKC breed standard that was the blue print for the breed does. It states a dog of correct size should weigh between 3 ½ and 7 lbs. The UKC standard goes so far as to disqualify a dog that does not fall within this size range. Toy Fox Terriers are both “Toys” and “Terriers”. The Toy Fox Terrier’s characteristic traits are his elegant head, square athletic body with a short tail set on high, and his short, satiny and predominantly white coat (with or without body spots). He is naturally well-groomed, proud, animated and alert. The head is elegant, balanced and expressive with no indication of coarseness. The distance from the nose to the stop is equal to the distance from the stop to the occipital point. The skull is slightly rounded but never domed or apple headed. The expression is intelligent, alert and full of interest. The eyes are round and dark, set well apart and fitting well into the sockets. The ears are high set, close together and balance with the size of the head and the body. When moving the backline is level and flat in motion as the little dog double tracks in a straight line with slight convergence at a trot. The movement is balanced and coordinated with good reach and strong drive. Any resemblance to a hackney gait is to be faulted. His lithe muscular body has a smooth elegant outline which moves forward effortlessly. Movement should be judged on a loose lead. The dog should never be strung up nor should he run around the ring at lightening speed. The forequarters are well angulated and the shoulder firmly set with adequate muscle but not overdeveloped. The shoulders are sloping and well lay back, blending smoothly from the neck to the back. The forechest is well developed. The standard is silent in regard to the TFT’s upper arm, its length or position on the body. However, the AKC standard leaves little doubt by stating “Fore-chest is well developed”. The “Terrier front” with its shorter upper arm and no fore-chest is a specialized digging front and is incorrect in the Toy Fox Terrier. 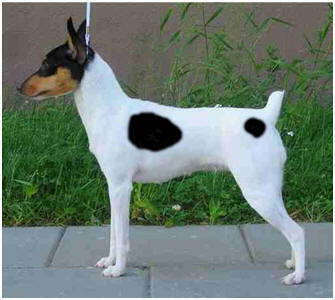 There are four color combinations allowed in the Toy Fox Terrier. They are white, black and tan tricolor; white, chocolate and tan tricolor; white and tan; and white and black. The body of the dog should be over fifty percent white and can have body spots that match the main color on the head. Blazes are acceptable as long as they do not extend into the eye or the ear. The above illustrations were created by Jeanne Flora and the written descriptions which serve to further clarify the AKC Breed Standard are the culmination of two years of work by the Judges Education Committee, Kelley Maldon, John Davidson, and Olen Nichols.